Dr. Schneider joined the Huntsville Cardiovascular Clinic in July 2011. He treats all aspects of adult heart disease, with a particular emphasis on stress tests and echocardiograms. Dr. Schneider attended medical school at Case Western Reserve University in Cleveland, OH, where he was awarded a Dean’s Scholarship, and partook in cardiac rotations at the Cleveland Clinic. 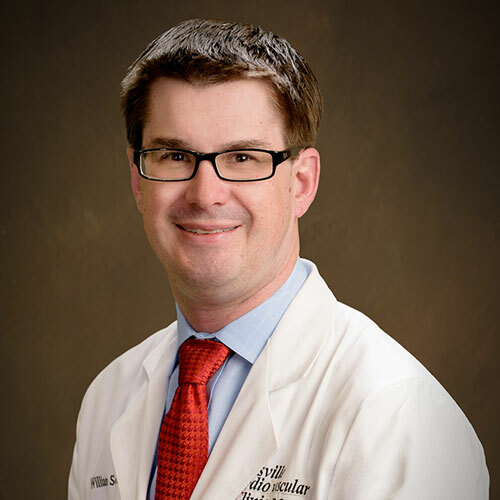 He completed an internal medicine residency at Barnes-Jewish Hospital through Washington University in St. Louis and a cardiology fellowship at the University of Louisville. He is board certified in Internal Medicine, Cardiovascular Disease, Nuclear Cardiology, and Echocardiography. He is a Fellow of the American College of Cardiology. He is active in the American Medical Association. Dr. Schneider lives in Huntsville and enjoys spending time with his wife and four children. They are very active in the community. He is on the medical staff at Crestwood Medical Center and Huntsville Hospital. He is currently accepting new patients.